If you are looking for a high quality, reliable electric paper cutter you have come to the right place. Whether your market is quick-print, copy shop, in-plant, offset, or on-demand, we have the ideal cutter for your needs. With options from MBM Triumph, Challenge, Formax and Standard Horizon we have an awesome selection with choices in virtually every price range. Equipped with state of the art security features including optical eyes, safety shields, double hand blade engagement, key locks and protected back gauges these cutters are designed to be power, fast, efficient and SAFE. Compare the models below by cutting width, capacity, brand and features. Cutting Length Behind Blade: 18"
This is MyBinding video. 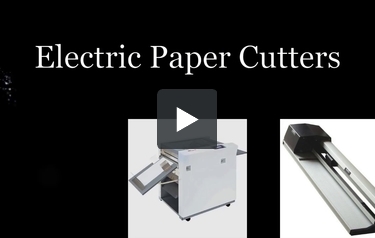 If you’re looking for a high-quality, reliable electric paper cutter, you’ve come to the right spot. Whether your market is quick print, copy shop, in plant, offset or on-demand, our cutters are ideal for your needs. We carry such brands as Foster, MBM Triumph, Ideal, Krug & Priester and Challenge Spartan, and we’re constantly bringing you new models and new manufacturers. We have classic heavy-duty machines that have been around for quite a while as well as the brand new ones on the market, like MBM Aerocut. Many of these machines we use in our own production facility here at MyBinding. We pride ourselves in our customer service. Give us a call and we’ll find you exactly what you need. We know this is a big purchase and we want to be your source. When image matters, MyBinding.